Kurly Tlapoyawa originally presented this lecture at the 2017 Northeastern Group of Nahuatl Scholars conference at Yale University. The years following the Mexican revolution saw an upsurge in a form of nationalism characterized by the exaltation of Mexico’s indigenous past. As a result, Kuauhtemok – the last sovereign Tlahtoani of the Mexika Empire – was elevated to a symbol of national pride and unity. The Declaration of Kuauhtemok is a text in Nawatl that has been circulated since the late 1960’s within the Mexicayotl movement, where it holds the status of a foundational and prophetic document. This movement claims that it is the final decree given by Kuauhtemok prior to the fall of Mexiko-Tenochtitlan on August 12, 1521. Allegedly, this message was memorized and spread throughout Mesoamerica by a series of runners, and has subsequently been passed down via oral tradition to this day. It is the position of Yankwik Mexikayotl that the text actually dates from the mid 20th century and is best understood as part of the mythologizing of Kuauhtemok in his role as cultural hero. Nonetheless, analysis of the text, its origins, and the means of its circulation provide important insight into the formation of contemporary folklore in the context of nationalist movements. It can be said that the figure of Kuauhtemok is the embodiment of indigenous nationalism in Mexico. The son of Awitzotl, the eighth Tlahtoani of the Mexika empire, Kuauhtemok was only 20 years old when he was elected Tlahtoani following the death of Kwitlawak in 1520. 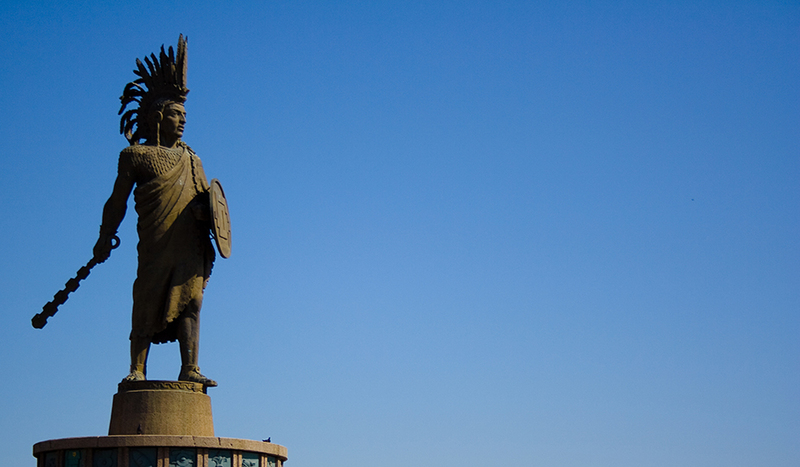 It was Kuauhtemok who led the final defensive stand of Mexiko-Tenochtitlan against the combined might of Hernan Cortes’ Spanish forces and Indigenous auxiliaries. It should come as no surprise then, that the image of Kuauhtemok has come to symbolize the resilience and resistance of the Mexican nation. During the Porfiriato, Mexico’s intellectuals sought to integrate the indigenous people into the Mexican national identity. Though as Christopher Fulton notes, “In most expressions of the time, the Indian was regarded in Romantic terms, not as an important actor in his own right but as the primeval source of the mestizo race, which was understood as the progressive agent in the nation’s history.” In the hands of Porfirian elites, Mexico’s Indigenous past was celebrated at the expense of its living indigenous communities. This view of Mexico’s indigenous people underscored the formation of cultural nationalism from the Porfiriato through the 1970s. This view is made all the more pronounced when we consider that Porfirio Diaz himself was known to powder his face white in an attempt to conceal his indigenous features. This policy of Indigenismo grew under the presidency of Lazaro Cardenas, and the slogan “Mexicanize Indians, don’t indianize Mexico”  became the rallying cry of the day. On September 26, 1949, Mexican archaeologist Eulalia Guzman excavated the church at Ichcateopan, Guerrero. She had been sent to investigate claims that the body of Kuauhtemok had been buried there in the 16th century by none other than Motolinia himself. Following clues contained in documents belonging to Salvador Juarez, Guzman recovered a collection of bones located under the altar of the church. Guzman determined the bones were authentic, and news quickly spread that the tomb of the young Tlahtoani had indeed been discovered, sparking celebrations across the Mexican countryside. Ultimately, a Grand Commission was formed by INAH to verify the authenticity of the bones, and concluded that the entire event was an elaborate hoax perpetrated by Salvador Juarez himself. Guzman was ostracized by the archaeological community for her sloppy fieldwork, and most likely went to her grave thinking that she had, in fact, found Kuauhtemok’s bones. A shrine to Kuauhtemok was established at the church, his alleged bones on prominent display for all to see. The town of Ichcateopan remains the destination for a yearly pilgrimage where hundreds gather to commemorate and honor Kuauhtemok – to this day. The mythologizing of Kuauhtemok took a leap forward with the appearance of the alleged “Declaration of Kuauhtemok.” The first printed appearance of the Declaration is found in the October 30, 1967 issue of Izkalotl, a periodical published by the organization known as the Movimiento Confederado Restaurador de la Cultura de Anauak (MCRCA). This organization was established in the late 1950’s by Rodolfo Nieva-López, with the intention of reclaiming an Indigenous Mexican identity and reestablishing the glory of pre-conquest Mexico. While I can certainly sympathize with these objectives, the approach taken by the MCRCA to accomplish them has proven to be grounded in fantasy rather than reality. “it has left us” nos ha dejado. “That it will come out this way once more” que otra vez saldrá. 7.- iuan yankuiotika tech tlauiliz. “and newly will illuminate us” y nuevamente nos alumbrará. “[mach inoka] there it is in the land of the dead it will extend” Pero mientras allá esté, en la mansión del silencio. “ it recognizes it as a great property” que sabemos es gran tesoro. “Our telpochcallis [commoner schools] our cuicacallis [song houses]” nuestros recintos para la juventud, nuestras casas para el canto. 28.- oki xi nachtokateh toyelizpan. “They sowed as seeds on our beings” sembraron en nuestro ser. “This our beloved land-mother Anahuac.” ésta nuestra amada madre tierra Anauak. The MCRCA adopted the romanticized figure of the Aztec warrior as the core symbol of Mexican ethnic identity, and the group had its main influence in urban middle and working class communities (Friedlander 1976). Its practices mixed Mexican nationalism, neo-Aztec religion (also prominently influenced by New Age ideas), the use and promotion of the classical Nawatl language, including the practitioners taking Nawatl names, and a new form of Aztec dance. In his book, Nieva-López claims that the declaration of Kuauhtemok was revealed to him by Estanislao Ramírez Ruíz (1887-1962), a chemical engineer from Tlahuac and a participant in the investigation of Kuauhtemok’s alleged tomb in Ichcateopan, and that Ramírez had himself received the tradition from his parents. Nieva-López adds that he wrote it down with the help of Nawatl speakers from Tepoztlán and the Huasteca. If the Declaration was indeed passed along to Nieva-López by Estanislao Ramírez , why is it never mentioned in any of the documents written by or about Ramírez? Also worth mentioning is the notable absence of the alleged “declaration” in any respectable history book or collection of Indigenous literature. Surely a work of such profound historical significance would merit a place in scholarship dealing with the fall of Mexiko-Tenochtitlan. Also, why wait until after Ramirez had died to reveal the declaration? These questions alone are enough to cast doubt upon the Declaration’s authenticity. The Nawatl text is a translation of the Spanish text, and not the reverse. Some words in the Nawatl text are employed in ways that are uncommon or unknown in colloquial or classical Nawatl, but which could be consistent with a word-for-word translation from Spanish. For example, Nawatl does not have a word for “but”, but the text uses the word mach, which usually is a negation particle, to correspond to Spanish pero (but). Several other constructions in the Nawatl texts stand out as suggestive of a too-direct translation from Spanish. Particularly revealing are two instances in which the Nawatl text switches without motivation to using second person singular possessive forms where the Spanish uses the ambiguous possessive pronouns “sus” which in the Spanish text refers back to a third person plural, but which can also be understood as second person singular if taken out of context. This suggests that the translator asked someone (presumably a native speaker) for a literal translation without providing sufficient context for the speaker to recover the plural reference, and that he or she did not themselves know enough Nawatl to realize that the translation they were given was a second person form. Another revealing glitch is the use of yankuiotika (newly) in correspondence with the Spanish “nuevamente” – the Nawatl word is not common and would be understood as “newly” not as “again” as is the intended meaning here. The translator was not a native Nawatl speaker, but had probably studied some classical Nawatl and occasionally used a colonial dictionary in producing the translation. Two words suggest that the translator read the word he wanted to write in a source that used a traditional colonial orthography, perhaps a dictionary, and erroneously transliterated them into the orthography favored by the MCRCA. The overall character of the Nawatl text however does not suggest a good command of colonial Nawatl. The fact that words are arbitrarily divided throughout the text shows that the translator could not have studied colonial Nawatl in any depth, and that they do not have a solid grasp of the grammar of the language. Many word forms are different from their forms in colonial Nawatl and suggest that the translator may have been familiar with a 20th century colloquial variety of Nawatl, or that the translator may have had help from native speakers to help with the translation of specific parts of the Spanish original. The arbitrary division of words also suggests that the translator, after hearing them from an oral source – perhaps a native speaker, wrote down phrase-by-phrase or word-by-word direct translations. The entire grammatical and syntactic structure of the text is atypical for both colonial and modern Nawatl, and it does not show either the rhetorical traits commonly associated with early colonial Nawatl oratory (e.g. metaphors, couplets, diphrasisms, cohesion) or the kind of formulaic language that would suggest an oral source of transmission (e.g. repetition, simple short phrases, topic-comment cohesion). Consequently, it is our conclusion that that text was most likely not passed down through oral tradition from Kuauhtemok, but that it was probably produced in Southern Mexico by Rodolfo Nieva-López and Estanislao Ramírez with the aid of some of their Nawatl speaking associates in the 1960s. While many cultural educators and practitioners of Aztec dance may certainly draw inspiration from the alleged “declaration,” it is without historical merit. Further distribution of the document is discouraged, as doing so only encourages the propagation of pseudohistory and ignores the actual cultural inheritance of Mexico’s indigenous people. Instead, it is the position of Yankwik Mexikayotl that the alleged “Declaration” be replaced with the following excerpt from Alvarado Tezozomoc’s Cronica Mexicayotl, as the message is far more inspiring and most importantly, it is not a work of fiction. The ancient men, the ancient women. Our great-great grandfathers, our ancestors. To us who come down from them. Their renown, their history, their memory. The children of the Mexicans, the children of the Tenochcans. I would like to thank Magnus Pharao Hansen, PhD for contributing to this article. Christopher Fulton, “Cuauhtémoc Regained,” Ehmcm Estudios de Historia Moderna y Contemporánea de México, no. 36 (2008): 5–43. Alicja Iwańska, The Truths of Others: An Essay on Nativistic Intellectuals in Mexico (Cambridge, Mass. : Schenkman Pub. Co., 1977), 47. “Izkalotl: resurgimiento del Anáhuak,” Izkalotl: resurgimiento del Anáhuak, 1960, octubre de 1967, 7. Judith Friedlander, Being Indian in Hueyapan: A Study of Forced Identity in Contemporary Mexico (New York: St. Martin’s Press, 1975). Lina Odena Güemes, Movimiento Confederado Restaurador de la Cultura de Anahuac (México, D.F: Centro de Investigaciones y Estudios Superiores en Antropología Social, 1984). “Mach” is used consistently as corresponding to Spanish “pero” [but] in this text. This is not a way of using this particle that I know, usually in Nawatl the “but” conjunction is expressed by aw (or its cognates, or iwan). This type of usage suggests to me that the text was first written in Spanish and translated into Nawatl, sometimes using a “word for word” translation style. The use of the optative particle man instead of ma: is common in the Morelos varieties, but uncommon in Colonial Nawatl and other dialect areas. This word in Nawatl would mean that something is new, it does not mean “again” as “nuevamente” does in Spanish – it is not a word that normally appears in Nawatl texts or spoken discourse. This suggests a direct translation from Spanish into Nawatl, without sufficient knowledge of the words meaning in the target language. Here we would usually expect the form toyolloh “our heart” with the suffix of inherent possession, to a native speaker this might suggest a heart that is not connected to a body. This word is very odd, in a way that also suggests a too literal translation from Spanish into Nawatl. The entire noun phrase weyi tlatki “great possession”, consisting of a noun and an adjective, is incorporated into the verb “mati” “to know/recognize as”. There are many much more common and elegant ways that such an appreciation for some prized possession can be expressed in Nawatl. This looks very much as if it is an attempt of a direct translation of “great treasure”. This is an erroneous form showing a possessed form of the locative tlachco “in the ball court” instead of the correct “totlachwan” “our ball courts”. This shows that the person producing the Nawatl was unfamiliar with the word for ball court (and the locative suffix -co which is no longer productive in Nawatl) and thought that the locative form was the root. This is an erroneous form showing a plural absolutive suffix on the possessed noun instead of the possessive suffix. Also, the person producing the Nawatl was unfamiliar with the usual irregular possessive form of ohtli, which takes the irregular possessive suffix –wi. A more correct form in most varieties would be “toohwiwan” or “toohwan”. This suggests that the translator/producer of the Nawatl text may not have been a native speaker. Should probably be a plural possessive prefix /i:n-telpoch-wan/. Here the Nawatl switches from third to second person plural reference, while the Spanish text uses “sus” (which is ambiguously third or second person plural). Again this suggests a translation from Spanish to Nawatl, with loss of contextual meaning. “Inoka” is consistently used in correspondence with Spanish ”mientras” “while”, I do not know this usage from any modern varieties. I have found the word “inoca”, but in a different meaning (as a demonstrative relative pronoun “that is”) in a testament from Xochimilco. “yoko” is not a transparent verb, though the yo- prefix suggests a past perfect form, the “ko” is not intelleigible to me. Perhaps a botched form of oyek “it was”? We assume that tlapalewilis is meant. Probably this is supposed to be ”tonehtoltiliswan” “our promises” – it is probably meant to translate “destiny” it appears again as nehtoltilis below with that translation. In Nawatl this is just a string of nouns with no clear syntactic relations between them, this is typical of attempts to make too literal translations of long Spanish noun phrases with ”de”, instead of making a more roundabout and grammatically natural (for Nawatl) way. There are two words with a prefix ”ken” corresponding to an augmentative adverb in the Spanish text. This would make sense if it was “sen-” “complete/whole”. This misspelling to me suggests that this was originally written with and that someone who did not speak Nawatl went through the process of transliterating the text from a colonial style orthography with c into the MCRCA orthography with for /s/ and for /k/. Only such a process could have produced this type of mistake. This sentence is very difficult to interpret, even if we assume that it says tosenmawiliz ”our total respect” and tosenpololis which would be something like ”our complete loss”, it is still not clear how this would fit in the context. This would usually be spelled and pronounced with kim as the plural object prefix and not kin- which does not usually occur before vowels. Again this could be a sign that it was translated from Spanish into Nahuatl by a non-native speaker. Again we have a shift from third person plural to second person singular corresponding to the ambiguity of Spanish “sus” yours/their. I have not encountered this phrase elsewhere, here it is used systematically to correspond to the Spanish “como bueno sea” “as it will be good”. I cannot easily derive this meaning from the Nawatl phrase which seems to me to mean something more like “as it will be”. Miguel León Portilla and Earl Shorris, In the Language of Kings: An Anthology of Mesoamerican Literature–Pre-Columbian to the Present (New York: W.W. Norton, 2001), 311. Great lecture! It’s time to put this myth to rest. BTW, I make this very same point in my dissertation.